Before you book there will no doubt be a number of questions you will want answering. To help in this we have compiled a list of the most frequently ask questions with answers of course. Can we view the kennels? Yes of course you can. We would expect you would wish to see where your dog would be staying. We do not however operate an "Open Door" policy and only show people around who have made an appointment. This is to ensure a certain degree of security for our boarding guests. Also that one of our team can be made available to properly show you around and answer any questions you may have. We also feel it is important for you to see who is looking after your dog as much as where he will be staying whilst you are away. Yes your dog will be exercised. At Bridge House Kennels each dog has access to its own individual covered run and in addition to this we have our own extensive ground for those all important walks. Yes of course you can. Here at Bridge House Kennels we offer a range of quality foods. Because we are a top show kennel and breeders of top show dogs. We are fully aware of the importance and benefits of feeding a well balanced diet to your dog. Your dogs feeding requirements are important to us and if you would prefer us to maintain your dog on food you provide we will do so. At Bridge House Kennels we provide absolutely everything required for your dogs stay. All we ask is for safety your dog is brought in on a lead. Customers are also welcome to bring there dogs favorite toy. Familiar bedding with his scent and scent from home can very often help your dog to settle. Avoid bringing to many toys and not to bring any feeding bowls (especially ceramic) as we prefer to use our own. If you wish to bring in his/her own treats then you are welcome but they are in plentiful supply at Bridge House Kennels. Does our dog need to be vaccinated? Your dog most certainly does need to be vaccinated. This is a requirement of our license. 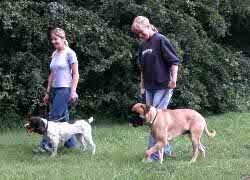 All dogs boarding with us must have there annual booster maintained and up to date. We will require proof of this before your dog can be admitted to our kennels. This is usually achieved by bringing your dog's up to date vaccination certificate which is provided by your vet. Should you have lost your vaccination certificate your vet can supply you with a duplicate providing of course you dogs vaccinations are up to date. We recommend that your dogs also has the Kennel Cough vaccination but this is not a compulsory requirement at Bridge House Kennels. We would ask if you wish to have your dog vaccinated against Kennel Cough please ensure this is done at least 14 days prior to your dog boarding with us. Now you are happy and have decided to let us look after your dog. These are the ways in which you may make a booking. In person: At the time of viewing you make a booking in person. By Telephone: Our telephone number is 01636 706970. The telephone is manned most of the time but on the rare occasion when it is not. You are encouraged to leave a message on our answer phone service and we will return your call ASAP. Please note that all bookings left on our answer service or sent by email must be confirmed back to you by one of our team. A further service provided by Bridge House Kennels is our collection and delivery service. This service is provided mainly for customers who do not have their own transport or who have genuine difficulty transporting there dogs to and from Bridge House Kennels. Our charges for this service are competitively priced and dependant on distance traveled. Please note this service is provided by our trained kennel staff and therefore pickup and delivery times have to be scheduled around our normal kennel routine. Unfortunately this service is limited to the Newark area. Bridge House Kennels business is built on Trust and Recommendation. Phil and Marita are well respected dog people around the show world with over 6o years experience between them in the world of dogs. Reaching the highest accolades possible within there world. Over the last 10 years the boarding kennel business has grown through the Trust and Recommendation of our customers. Our customer base reaches far a field from Newcastle in the North to Swindon and Southampton in the South and each year we enjoy the company of our regular customers, and there dogs, who all seem to enjoy the Bridge House Kennel experience.